Next: Virtual Reality Remote Control FPV Race Car - Puts You In the Driver's Seat! 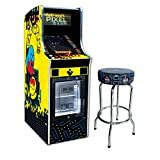 This cool new yet quite retro Pac-Man Pixel Bash Chill from Namco not only lets your bring a glorious 1980s arcade machine into your home with 32 classic video games including: Pac-Man, Ms. Pac-Man, Galaga, and Dig Dug, it also has a built-in mini fridge in the spot where you used to insert coins. So while you control Pac-Man around the glowing maze in search of energizing Power Pellets, you can also re-energize yourself with a refreshing drink of your choice from the refrigerated beverage cooler. It features a durable upright-style cabinet, 19" LCD monitor, authentic joystick, classic button controls, 2 cupholders, a bottle opener, and, best of all, it's alway set to free play - no quarters needed. 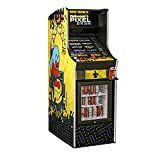 Namco Pac-Man Pixel Bash Chill Home Upright with 30"
Pac-man Pixel Bash Chill Home Upright Arcade Game With 30"